When Mrs Wroe asked me to sing the solo, I was beside myself, humbled. It was the greatest of honours to sing on Sermon Sunday, at my church Cawdor St Methodist (formerly in the Farnworth circuit). Such anticipation as the church would be packed full and in the crowd my family and friends, much like today. To my family and friends who have travelled to be here thank you for coming and supporting me, for your encouragement, love and care, I do love you all very much and you are all very precious to me. Especially John, thank you for walking this journey that may have often felt to you like a solo gig; I know, I cannot do anything without your prayers, common sense and deep abiding love and friendship. Thank you. While I am saying thank you, I want to say thank you to the district team in Nottingham and Derby for all the support, encouragement and willingness to try out new things, to take risks and to fail together while still laughing. Thank you to the Church for entrusting me with this even greater honour of being President, not for one moment did I imagine that I would stand before you having touched Wesley's field bible, nor for a fleeting moment, wearing this cross around my neck. I must admit, I feel a bit like I did on that day many years ago when asked to sing the solo, hoping I don't mess it up, hoping that the words come out in the right order, hoping most of all that I do not let God down and hoping my prayers of doing it right will be answered. 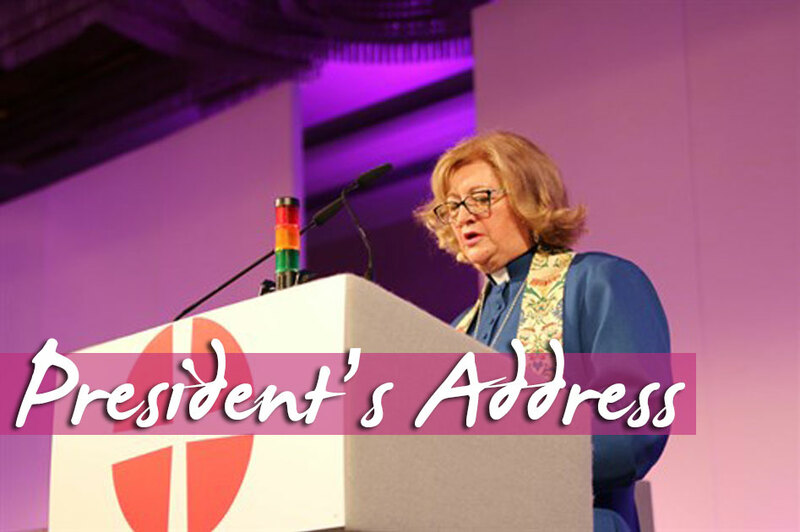 After all, this is not Loraine Mellor's Presidency it's the Church's, of which we are all a part. Yet, I am immensely grateful to all the Past Presidents and Vice-Presidents for all they have shared with us over the years and for the ways in which you have shaped us as a church and for me personally, as a presbyter helped to shape my ministry. This is our story, yours and mine. I have taken to heart and have experienced glimpses of God's glory of bringing one person to faith, by being a discipleship movement shaped for mission, of finding a distinctive voice, I am still and will continue to want to see pastors in every church, being on the edge of Pentecost and so much more. I am not sure if there are any rules for the Presidential Address but Jill and I have chosen together to explore the theme Day by Day, engaging in Mission and discipleship using Acts 2 42-47. A reading which many of us know so well that paints a picture of the early church at the time of the first Christians, people of the way and it still has a lot to say to us today. I will over the next year, not today, be developing themes from the reading as we travel the Connexion. We will use the reading in worship tomorrow and so today for my part, I want to share those things that I know all of my predecessors will have done in sharing what I think God is saying to us as a Church and using the lens of the passage of scripture from John, which Sally read to us. I have to say in all honesty, that I have really struggled with this Presidential Address almost from the moment of my designation and more than one person has said when I explained my dilemma 'but you have lots to say!' And to a certain extent they are not wrong, but what is the point of the Presidential Address, why do we have it, what is it supposed to do? In the end, I decided that it is not at all about what I, Loraine Mellor, might want to say to the Church, but what God is saying to us as a church. Yet, how do we discern that, how do we sort out in our minds what are our desires, what we want, what we crave and what God wants or not saying to the church? Well of course, you know the answer; we do that through prayer through silence, through listening, through that still small voice and the voices and stories of others and through discerning and experience. Catharine Booth said: "If we are to better the future we must disturb the present"
So how are we disturbing the present in the Church today? I do not for one second believe that God has done with the Methodist Church just yet, and I am not at all ready for the funeral. But there is no getting away from the fact that we are a declining Church and we have to stop kidding ourselves that we are good at evangelism. Does this keep you awake at night? Because it does me! It worries me that we have dropped our membership figures below 200,000. It worries me that circuits cannot attract presbyters to their appointment, and the effect that has on the local church, the circuit staff and stewards. It worries me that a lot of churches have a lot of money in trust funds that is not being used for mission and evangelism - £5 million in the district where I serve alone and many, many more millions around the Connexion. It worries me that some churches and circuits are still using old models of ministry and have a seemingly inability to change and adapt to the context, which we find ourselves in today. It worries me when I see ministers struggling with the workload, the number of ministers who choose to or are forced (due to ill health) to retire early. It worries me when I see the sheer number of meetings we ask our lay people to attend. It worries me when I think we have so much as a Methodist Church to offer to our communities and that our connexionalism is a gift of God. This is of course is from my perspective of a district chair who week by week engages with circuits. It's my view and you may well see it differently, but I think we need to change. I think that change needs to be radical in order that we will survive and grow. I also need to remind myself that Jesus is Lord of the Church, and therefore I do not have to be, because he is, I should sleep at night. So let us rejoice in those areas of our connexion where we are growing and are seeing new disciples. I know I am part of a declining Church, this is my story and your story, but I also believe we are also a transitional church as we have all read in the connexion magazine, so what are we going do about it because, brothers and sisters? Because I believe we must do something. We have to change the shape, the narrative of the story and I contend we do that when the story is about our worship, about the hospitality that we offer, about the generosity of our sharing, by being disciples who are shaped by Jesus and his cross and by making decisions that give us a hope and a future. They are reflective of course of the themes our calling: worship, learning and caring, service and evangelism. And they are themes that I wish to pick up from John's gospel. The reading from the end of John's gospel gives us a model that I want to explore this afternoon. So this Presidential address from a biblical perspective, well, at least I hope it is. We are at the end of Jesus earthly ministry, it is not the first time that the disciples have encountered Jesus. And once again, it's Peter who exclaims 'It is the Lord.' So surely it is first about our relationship with Jesus and about our worship of him. Roger said this in the last year: "In a world where a multitude of truths and an infinite choice of lifestyles seem possible, Christians need to shape their lives by the pattern of Jesus. We have to be Jesus- Shaped"
The only way we can become Jesus shaped is by experiencing Jesus in our worship. Our worship today needs be authentic, relevant, awe-inspiring and God centred. Jesus is standing on the shore watching, waiting and praying for his disciples. He prepares breakfast for them, they are not far from shore, and they can converse together. Initially, they do not see who it is, but then Peter speaks, 'it is the Lord.' And here we see Peter who loved Jesus, who followed him, learned from him, shared with him, been bereaved, hurt, anxious, faithless and faithful and now hear the words, the words of worship of his Lord, how passionate, and poignant. You can almost feel Peter breathe them over the morning mist, words of worship and of wonder, 'It is the Lord'. As disciples of Christ, our first priority must be to worship in that worship we must hear the word of God preached and the preached word must be relevant to our hearer. It must relate to where we are and for many of us today in a church that is not multi-generational, we are often preaching to retired, elderly, small in number congregations, so what can we say to them about what it means to worship and be energised and inspired? That morning thousands of years ago on that lake, in that boat, Peter moved from being distressed and anxious, he had fished all night, he had worked hard, he had gone back to what he knew and in that moment was inspired and energised by his Lord. Our reason for being, be it aged 9 or 90, is that we are to offer our 'worth ship' to God. Our 'worth ship' to God can be expressed in myriad of ways, from the great hymns of faith to the newest worship song from Taize to Iona, in silence and in a joyful noise; it can be liturgical and extemporary. Yet, some of the worship some of us encounter can be dull and narrow. Our diet in worship is not worshipful, but centred around our needs, what we like and we enjoy. I am sure some of you (like me) have had said at the church door as you shake hands after the worship- "I did not like your hymns much today," "I did not like what you said about the passage of scripture." But that is about I, not about what worship should be and our worth ship of God. Peter was no longer thinking of himself when he realised it was Jesus standing on the shore he quickly put his clothes back on as he rushed to make it to the shore swimming and wading to get to Jesus. When our worship is vibrant, it is focused on God when the word is preached and is relevant then our people are happy to invite family and friends. "Worth ship" is an imperative of our faith. That is where we encounter the living God. Where the place of preaching plays a central role, when people encounter Jesus through the preached word, that's when people grow in faith because their story resonates with the story from scripture. We all know that Presbyters and Deacons are itinerant and Local Preachers are local, yet in some of our circuits do we have this the wrong way round? Church growth commentators tell us that consistency in worship is important. When people in the congregations see the same people week on week leading worship this gives confidence. Churches that have a regular team leading worship grow and we know of these places around the Connexion where they are seeing significant growth through worship, through the preached word, through being able to encounter a loving God and experience his glory, power, and majesty for themselves. So to enable our churches, to enable our people to encounter the gospel, worship needs to be of the highest quality, it needs to be focused on God and our 'worth ship' of Him. Where the word of God is preached, is consistent and relevant, and its need to be led every week by a small collaborative team of preachers and worship leaders. Oscar Romero said: "A church that doesn't provoke any crises, a gospel that doesn't unsettle, a word of God that doesn't get under anyone's skin, a word of God that doesn't touch the real sin of the society in which it is being proclaimed?- what gospel is that?" We see in this passage of scripture that the disciples are fishing, the commentators believe and we know from the scripture that they had encountered Jesus since his crucifixion and this time Jesus tells them to throw the net on the other side of the boat. They must have wondered if life could get any worse. The agony of the last few days and weeks.Jesus is dead, what now? They go to fish and catch nothing, but they were fishermen, they go back to their roots. They know this lake like the back of their hands. Does this reading suggest to you that Jesus referred to the fish as people? Yet many of us over the years have seen this in the passage, and I thinks it's there. There is a link in our minds to the calling of the disciples when Jesus says follow me and I will make you fishers of people. I want to suggest another way to look at it. It not for me about the fish caught, it is about the disciples. When they drag the fishing net full of fish to the shore Jesus has already started to cook breakfast for them, yet he says, 'come bring some of the fish you have caught as well'. Hospitality and generosity seen in a sentence. The hospitality that Jesus offers to his disciples in bread and fish and the way in which the disciples are able to respond out of their abundance. Is this not the blue print for our churches today to enable us to grow if our model of mission and ministry is focused around hospitality and generosity? A few months ago, I heard someone say that the key thing for growth is that you must see failure as your friend. If your learn from what you did you will make a difference. I know from my own experience that successful growing churches that share the gospel have a long history of things they have tried and failed at. Earlier this year the Archbishop of Canterbury said: "We must be cross-shaped, foot-washing, Jesus following, confident in faith and humble in service - and above all outward looking." I wonder how many of us want to change the world, because I know I do. I want every single person on this planet to know the love of God. And I make absolutely no apology for that at all. So often our dreams are limited, how big are your dreams and who limits them, not God, so it's us, the Church. If we are honest it is often us - we are afraid. I believe that our role as disciples is to express hope in a society that is disintegrating. Our role is to be connexional as that is our gift, and to use the resources of each other, each church, each circuit, each district and to stop reinventing the wheel. Jesus asked the disciples to throw the net on the other side of the boat and to come and share what they had caught, to do what they knew best and he added value, why should that not be the case today for us in our churches? This God of ours, this Jesus whom we worship, this breath of the Spirit - I do not think that he is saying do what we don't know, it's about doing what we do know. There are masses of fish in the net, yet it didn't break, God's generosity is infinite. Yet many of us in the Church today find ourselves not able to find people anymore to do the jobs that need to be done. We can't find treasurers, stewards, pastoral visitors, ministers, so why if that is the situation we are in, are we are perpetuating a system and a structure that is creaking. Why are we reinventing the wheel in every church, why are we not sharing our resources? Are some of us not being as generous and as hospitable as we could be? Jesus already had breakfast cooking, the disciples brought what they had, and so it becomes a combined breakfast of sharing of what was on offer: a sharing of time, of fellowship, of talking together, of love in action, and John paints such a beautiful word picture. So why, I ask myself are we fearful sometimes of other churches in our own circuit? Surely, it is about building relationships about joining in about being generous with what we have, about being incredibly and infinitely hospitable. Surely, it is about the rich church helping the poor church, and I don't just mean in terms of money! It is about people resource, about gift resource, it is about joining in and really being connexional. Now I know it sounds so simplistic. It is not just about being generous and hospitable with each other, it's also about all those who day by day and week by week come into our buildings. The people who live next door to us, who live in our communities. Yet, what might that generosity and hospitality look like for you in your context? What is the first thing we all have that we can share? Now I know you that with however many of us there are here this afternoon we will come up with lots of different ideas but I want to say today, it is about the gospel of Jesus Christ. What can be more generous than sharing the love of God. Many of us fearful of sharing our faith, of witnessing to this great and mighty God who we worship and I can understand that we may be fearful of being rebuffed. We may be afraid of the questions that we might not be able to answer. We may feel inadequate for the task, well join the club as we all feel like that at some time or other, yet, I know we are not ashamed of God and our faith. However, the reality is that in some places we do hang on to structures in the local church, which hinder our mission and do not meet people's needs where they are in society today. We are not as hospitable and as generous as we could be. I know too, from my own experience as a district chair we get bogged down by so many meetings that we have no time for being involved in mission and in sharing the Love of God. Do you think it all might be rather divisive and its easier to talk about what is not relevant and not to spend time learning how to share our faith? The aim of 'time to talk of God' is: 'to recognise our role and responsibility in sharing our faith today and to gain confidence in our personal story. So what are we doing in our churches to encourage people to talk of God? Do we have a growth plan in place, which includes a series of opportunities for people to learn what it means to share faith? Does the structure of our Church maximise the opportunity for people to learn how to be generous with what we have? Are our churches structured so that we can offer hospitality to all those we encounter and does a cup of instant coffee and a rich tea biscuit after worship speak to you of generosity and hospitality? At our current rate of decline we need to make members at 3 times the numbers we are making now and I am sure you are aware that 85% of those who come to faith today are under the age of 25. I want to ask myself some questions. I know we are declining, then why am I not encouraging every circuit to have an evangelist on the team. Why am I not encouraging every local church to have a youth worker, even if it is only for a few hours every week? I rejoice that some churches and circuits have growth plans in place. I rejoice that some churches and circuits have a budget line for mission and evangelism. I ask myself another question. 'How am I building confidence among our congregations to witness in evangelism?'. My fear and my nightmare, is that as a church we will decline so much we will go out of existence as Methodists, we will not have many people around but we will be very rich as there are millions of pounds locked away in church funds. I fear that we are not being hospitable and generous with what we have. We are not using our money to enabling people to learn how to share Jesus. Our money is not paying for an evangelist, not funding a youth worker, engaging with the one program, having an intern, not serving the poor, not feeding the hungry, not sharing the amazing wonderful life enriching love of God, but moreover, not appreciating that everyone we encounter has something to offer as well. Elaine A. Heath, in her book The Mystic Way of Evangelism, puts it like this: "Evangelism is intrinsically relational, the outcome of love of neighbour, for to love our neighbour is to share the love of God holistically. The proper context for evangelism is authentic Christian community, where the expression of loving community is the greatest apologetic for the gospel. Let's build relationships, share this great gospel that you are loved by God. That's where it starts, with relationships. The disciples had no reason to trust the man shouting at them from the shore, but subconsciously they knew it was Jesus. Yet, Peter was the first to recognise him, but when they did they came as well, they joined in, they trusted their leader and in it all rescued their belief, their understanding, their commitment to the Lord and reignited their belief in the gospel and together they turned around a situation that looked doomed. Out all night fishing, caught nothing, but then over breakfast they discovered that no all was lost. In fact it was just the beginning and with the Lord it all changed. We have to focus primality on our worship where we encounter our living God, we have to be generous and hospitable and we have to make some decisions to give us a hope and a future. The disciples had a number of decisions to make that day. Should they go fishing at all? Having decided that is was worth it, they had another decision to make, should they throw the net on the other side of the boat when all there inclinations were telling them that it is not the right way to fish. Should they be listing to the voice of the man standing on the shoreline? Then the decision to follow to the shore dragging the nets full of fish, and finally the last decision of all, to take what they had caught and join in the breakfast. I think the reason some of us do not talk about our faith is that we do not think we have anything to offer. Sisters and brothers you have much to offer. Have confidence, we can as disciples enable the Church to grow and to make disciples. Its about all of us, people of faith. John Millbank a Theologian at Nottingham University, speaking about the Church of England, said: "The future of the CofE's mission depends very much on the restoration of a learned clergy who will once again command cultural respect." That quote rather assumes a lot, but made me question what are we doing, what decisions are we making that means that we are continuing to spread our ministers ever more thinly and not putting pastors into our churches. The reality is we have too many churches in the wrong places for our communities today. Great 100 years ago, but our communities have moved. We don't have too many churches. We don't have too many churches, we just don't have enough people in them. Therefore we need a touch of Jesus so we can see his glory. The disciples over breakfast had a touch of glory and moved by their decision making from one position to another. So let's move too, lets replant churches, Jesus showed the disciples another way, they had nothing in the nets, we know we don't have enough people, not enough ordained ministers and in a declining Church and an ageing Church and we ask ourselves where are the ordained going come from unless we radically change our position. Why do some churches not have a growth plan in place, but also for some, do not have a palliative pastoral terminal care plan in place either? The first 24 years of my life after school was in the health service, and I loved it. It was very different being a nurse in the 70s and 80s than it is today. We had Matrons, I was terrified of mine, she was called Miss Markham, but we phased her out. We then had nursing officers, I was one, but we then got phased out. And now we are back to matrons again. Cancer then was a sentence, not a word. Macmillan nurses did not exist, we did not have end of life care plans we did not have care plans. We did not have terminal care plans now we do and they contain pastoral, spiritual, physical, family care plans. When we know the end of life is approaching. Therefore, I wonder, why do we not have that in place when we know the end of some of our churches life is approaching? The Church is almost, if not past the tipping point when we all need to take some risks in mission and our discipleship to enable us to grow. The disciples had to take a few risks that day. I am trying to be positive and commit myself to telling good news stories and I flatly refuse to buy into the story of decline. But I don't want to be the sort of person who ignores the voice of Jesus calling from the shore. I don't want to buy into the rhetoric in the fear that I might start to believe it, but I also have to be realistic and I don't want to be seen as burying my head in the sand either. If we keep talking of decline, we will come to believe our own publicity. Therefore, my call today is as the Conference, as the Connexion, as a local church and circuit as districts, is 'let's change the culture.' Knowing that the word culture means how we do things around here. Let's take some risky decisions, just as those first disciples did thousands of years ago and change as they did. Let us commit to talk of God, to make new disciples. Let us achieve this by being hospitable, generous and loving our people, and encouraging our people to talk of God. Let's release our ministers to engage in mission and not maintenance. To be where Jesus would be, eating with them, sharing with them, with those who are homeless: the hungry, the lonely, the bereaved, to do all the things that Rachel and Roger have spent the last year encouraging us in - to develop new partnerships, new relationships. One of our charisms as a Church is that we believe that our unique blend of social justice and that evangelism goes hand in hand. So let's continue to believe it. We have much to offer. So what is your church and circuit's vision for growth? Remembering that old Japanese proverb: "Vision without action is a daydream, action without vision is a nightmare" and then the words of an unknown commentator: "Where there is no vision, the people perish, but where there is no process or structure the vision is doomed." Let us focus on our worship where we encounter our living God, we have to be generous and hospitable and we have to make some decisions which give us a hope and a future. I know I am part at present of a declining Church, but I am not part of a declining gospel. The gospel of Jesus Christ is here to stay, but has the time not come of us to be radical to take some risks in order that we can grow? Because you see, perhaps in my naivety I don't believe that God is done with us just yet.